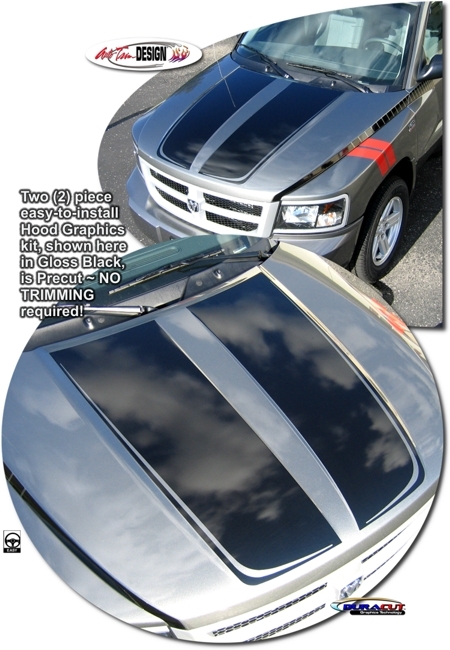 Trick out your '08-Current Dodge Dakota with this aggressive looking Hood Graphic kit. This easy-to-install kit is packaged as a set of two (2) pieces which features a unique pinstripe at the outer edge as shown. They're PRECUT and ready to install in a wide variety of colors - NO TRIMMING required! Kit is specifically made for the '08-Current Dodge Dakota factory Hood and will not fit any other vehicle.